Straw pellet production line is making use of various kinds of waste straw to make into biomass pellets, such as corn straw, rice straw, wheat straw and cotton straw. Straw pellets are one renewable fuel and featured by high calorific value, low moisture content, minimal amounts of ash content, long burning time and environmental friendly. Straw pellets can be used to replace oil, coal and gas when burnt in suitable biomass boiler. Calorific value of straw pellets are about 18-19 MJ/kg, ash content lower than 3%, moisture content lower tan 10%, all these make straw pellets suitable for burning. Straw cutting machine is adopted to cut straw, corn stalk, wheat straw, peanut, dry green weeds, cotton stalk, thorns, sorghum stalk, grass, coarse fodder, etc. This machine is featured by easy feeding, high output, stable performance, simple operation and high efficiency. Straw cutting machine is indispensable machine in straw pellet production process. During cutting process, straw cutter can also be free from diameter, length, moisture content of various kinds of straw bale. Straws are sent to the wood hammer mill at this process to be grinded. 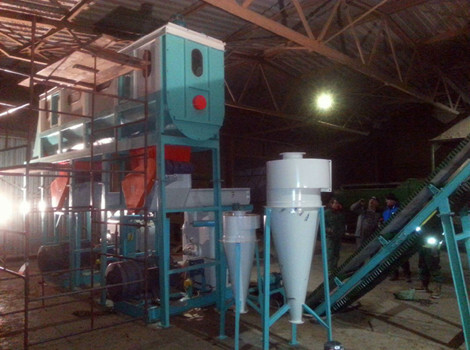 Wood hammer crusher is specially suitable for medium and large scale products processing. This hammer mill is equipped with advanced blade metallurgy and the heavy-duty rotor, which can make it be able to grind with a fineness of 50 mesh or more. With different fineness and production output available, the wood crushing machine enjoyed great popularity by pellet mill processing factories. Ring die straw pellet mill is widely used in mass industrial production of biomass pellets. It has wide application and can be used to process wheat straw, palm husk, rice straw, paddy straw, sawdust, groundnut shell, rice husk and many other agro wastes. Ring die of this machine adopts international and advanced technology, which enable the machine to have long service life and high quality. 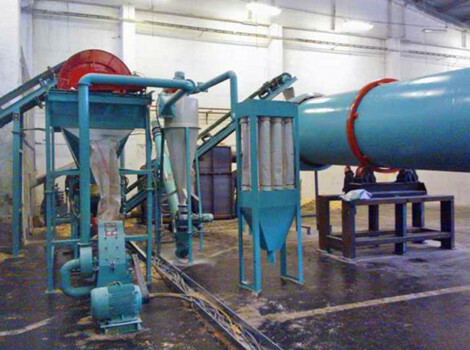 Ring die straw pellet mill is equipped with permanent magnet device to remove impurities in the pelletizing process. After the pelletizing process, the straw pellets are with high temperature of about 60-80 degree and high moisture content of about 15%, so a cooler is needed in this process to reduce the moisture content and temperature and thus make straw pellets easy to store. After cooling the temperature of straw pellets can be less than 3 to 5℃ of the room temperature. Packing process is necessary to protect straw pellet from damp and dust after cooling. This packing machine is equipped with high speed weighing system which is characterized by high efficiency and flexibility.